See what’s inside this special digital-only January 2019 issue of Kayak. Canada’s history is everyone’s history, but sometimes it’s important to zero in on stories we don’t get to hear as often. That’s what this special digital issue is all about — we’re celebrating some of the amazing women who helped make our country what it is today. Many fought for women’s rights at the same time as they were doing great things in medicine, art, journalism, business, science, politics, agriculture, music, sports and more. You’ll meet 74 women who made a difference in just one article, plus lots more throughout the issue. Find out where you can visit to learn the stories of more great Canadian women. Read about the way Indigenous women have faced and fought double discrimination. Discover the bravery and brilliance of Thanadelthur, the tireless work of Thérèse Casgrain, meet Canada’s first (and only) female prime minister and laugh along with the clever women who helped win the right to vote. 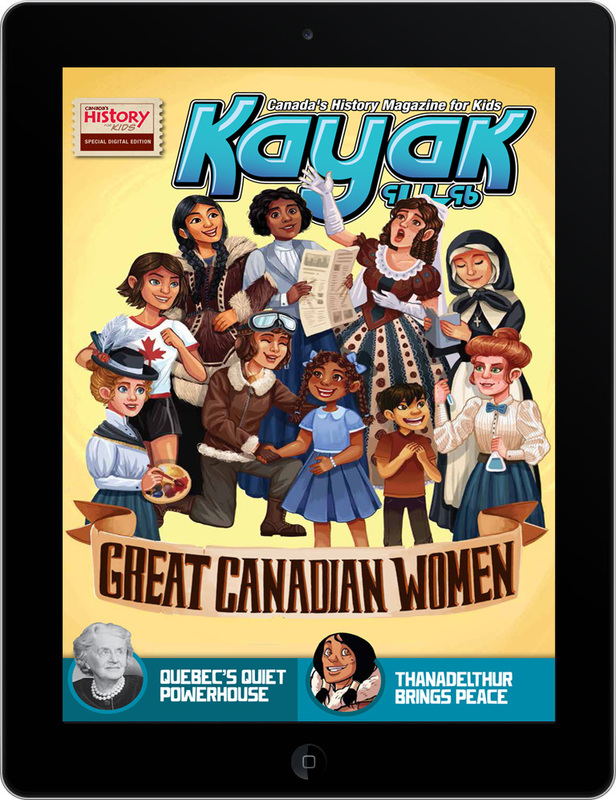 We hope you’ll agree that this issue of Kayak is one of the greatest in HERstory! What do you like to do in your spare time? First of all, you’re lucky to have spare time at all, compared to kids in Canada’s past. But, from simple toys to schoolyard games, kids have always been good at finding fun things to do. It can be beautiful, surprising, thought-provoking or funny — art is an important way that we think about ourselves and our country. You’ll meet all kind of artists and see their work in this issue of Kayak.